If you are a member of Persatuan, please ensure you have obtained the new 2012 car sticker from your zone leader to avoid registration at guard house when you enter the Taman. Please paste this sticker onto your car wind screen even you have access card, in case of power failure or the card reader is malfunctioning, this sticker is your identification for avoiding registration during your exit time. 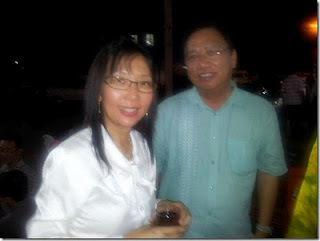 RA Chairman Mr Kong took the opportunity to express gratitude to YB Teresa Kok for Selangor Exco approval on the RM2.6m sunken road repair work at a dinner function in Puchong on 8Jan2012.